L'Albero Dei Gelati opened their first stateside satellite last Thursday on 5th Avenue in Park Slope. The Italian import has three locations in Italy and each, including the new Brooklyn location, borrows from the Slow Food Movement that started in Piedmont in the 80s. L'Albero's mission is to source ingredients locally and from farmers who practice sustainable farming. The gelato is the main draw here, but L'Albero also serves coffee, beer and wine, meat and cheese, excellent panini (like the corteccia with mascarpone, lardo, dark chocolate, and black pepper), and bakes their own bread/pastries in-house. The gelateria opens at 10am on weekends, 11am during the week. Cantelope sorbet for breakfast anyone? The Slow Food Guide to Italian Wines, the mecca of all Italian wine guides, is holding an even tonight offering the first ever English publication of their book. Held at the Metropolitan Pavilion, 125 W 18th Street, the sold out event will feature 140 different wines from over 60+ producers. This Monday, the 30th, from 6:30 to 9pm, the Metropolitan Pavilion will be hosting a tasting of 140 different wines, all of which are featured in this years first ever English publication. The Pavilion is at 125 W. 18th Street. Admission: $42, includes a copy of the guide. 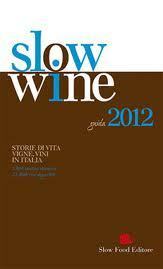 Slow Wine is a branch of the Slow Food movement that started in Piedmont in the 80s. It is an evaluation of wineries that takes into account key factors such as viticultural practices and sustainability. The Slow Wine Guide is the closest you can get to walking through Italy's vineyards without buying a flight.